224 pages, 5.5" x 8.5"
Whether it's a war zone or a civil disaster area, traumatic injuries often occur in remote, unsanitary locations. This book teaches advanced field procedures for small wound repair, care of the infected wound, IV therapy, pain control, amputations, treatment of burns, airway procedures and more. 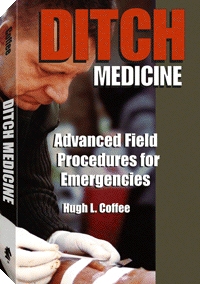 Hugh L Coffee is a professional paramedic with extensive experience administering emergency medicine in Third World and battlefield environments. His many specialities include improvising medical equipment from available materials and performing disaster-medicine procedures under primitive conditions.